The first written record of pigs in a blanket occurs in Betty Crocker’s Cooking for Kids in 1957. 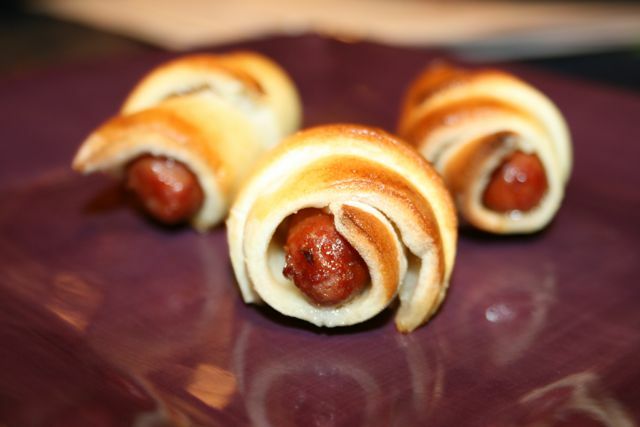 Pigs in a blanket are also known as devils on horsebacks, kilted sausages, and wiener winks. In the United Kingdom, pigs in blankets are small sausages, or chipolatas wrapped up in bacon. In America, pigs in a blanket often refers to hot dogs, Vienna sausages, or breakfast sausages wrapped in biscuit dough, croissant dough or a pancake and then baked. You can combine these dishes by wrapping your sausage in bacon, then cooking them into a biscuit or croissant. 1949 Chocolate rationing ends in Britain. 1994 The world’s largest lollipop, 3,011 pounds, is made in Denmark.